In accordance with federal regulations as set forth by the Higher Education Act of 1965 (HEA), as amended by the Higher Education Opportunity Act of 2008 (HEOA), below is a summary of consumer information that must be disclosed to all students at Enterprise State Community College (ESCC). Each topic listed below is a brief description of the information that must be disclosed and explains how it may be obtained. Enterprise State Community College is accredited by the Southern Association of Colleges and Schools Commission on Colleges to award Associate’s degrees and certificates. Contact the Commission on Colleges at 1866 Southern Lane, Decatur, Georgia 30033-4097 or call 404-679-4500 for questions about the accreditation of Enterprise State Community College. Specific questions regarding ESCC’s educational programs, admission requirements, financial aid, and other matters related specifically to the College should be forwarded directly to the College.In accordance with federal regulations as set forth by the Higher Education Act of 1965 (HEA), as amended by the Higher Education Opportunity Act of 2008 (HEOA), below is a summary of consumer information that must be disclosed to all students at Enterprise State Community College (ESCC). Each topic listed below is a brief description of the information that must be disclosed and explains how it may be obtained. If you need assistance in obtaining information listed or you would like a copy, please contact the respective location noted in each section or the Office of Planning, Information Services and Institutional Effectiveness. The Family Educational Rights and Privacy Act (FERPA) is a Federal law that protects the privacy of student education records. The Act establishes the rules and regulations regarding access to and disclosure of student records. It provides for the right to inspect and review education records, the right to seek to amend those records, and the right to limit the disclosure of information from the records. To fulfill FERPA requirements, the College has established policies regarding student records. These policies outline a student’s rights regarding his/her records, where records about the student may be kept and maintained, what kinds of information are in the records, the conditions under which the student or anyone else may have access to information in the records, and what action a student can take if it is believed student’s rights have been compromised. Policies on privacy of students and release of records are included on pages 66 and 72 of the College Catalog and Student Handbook. The College is also required to annually notify students of their rights under FERPA. To review and obtain a written copy of the information regarding FERPA, contact the Associate Dean of Students. Enterprise State Community complies with Section 504 of the Rehabilitation Act of 1973 and the Americans with Disabilities Act (ADA) of 1990. A person who may have a disability and require special materials, services, or assistance, or has questions relating to accessibility, should contact the ESCC Disability Support Services Staff for respective campuses, listed on page 13 of the College Catalog and Student Handbook. For TDD users in Alabama, the Alabama Relay Center is available by calling 1-800-548-2546. Click the following links to view the Disability Support Services Brochure and/or the Disability Support Services Information, Policies, and Procedures Manual for Students. Contact information for all sites can be found Here. Information is reported to the National Center for Educational Statistics (NCES) through the Integrated Postsecondary Education Data System (IPEDS). Additional information may be viewed on the NCES College Navigator. Tuition and fees are included on page 25 in the College Catalog and Student Handbook and on the College website. Information is also reported to the National Center for Education Statistics (NCES). Tuition, fees, and estimated student expenses can be viewed on the NCES College Navigator. Enterprise State Community College’s Net Price Calculator provides estimated net price information to current and prospective students and their families based on a student’s individual circumstances. Information is also reported to the National Center for Education Statistics (NCES), and can be viewed at the NCES College Navigator. Textbook prices and information by course can be found on the College website. Information about the College’s academic programs, degree offerings, and certificate programs is available beginning on page 78 in the College Catalog and Student Handbook. For information regarding programs or additional questions, contact the Dean of Instruction. Information is reported to the National Center for Education Statistics (NCES) and a list of programs and majors can be viewed on the NCES College Navigator. Enterprise State Community College has a refund policy that stipulates the amount of tuition and fees to be refunded to students who withdraw from classes during a term. This policy is published by the Business Office and is included on page 25 in the College Catalog and Student Handbook. Questions regarding the calculations of refunds may be directed to theBusiness Office. Enterprise State Community College complies with federal regulations relative to return of tuition and other institutional charges for all Title IV recipients. The Federal Return of Title IV Funds Policy is to be used for a Title IV student who completely withdraws from all classes. The policy shall also be applied to those students who cease attendance in all classes but do not officially withdraw. The Return in Compliance with Federal Regulations is included on page 25 in the CollegeCatalog and Student Handbook. The federal government mandates that students who withdraw from all classes may only keep the financial aid (federal “Title IV grant”) they have “earned” up to the time of withdrawal. Funds that were disbursed in excess of the earned amount must be returned by the College and/or the student to the federal government. Questions regarding the calculations of refunds may be directed to the Business Office. Enterprise State Community College’s withdrawal policies for dropping a course or all courses can be found on pages 73-74 in the College Catalog and Student Handbook. Enterprise State Community College’s policies regarding general principles for the transfer of credit are outlined on pages 19-20 in the College Catalog and Student Handbook. Students or prospective students with questions concerning transfer of credit may contact the Associate Dean of Students. Course work transferred or accepted for credit toward an undergraduate program must represent collegiate course work relevant to the formal award. Course content and level of instruction must result in student competencies at least equivalent to those of students enrolled in College undergraduate formal award programs. In assessing and documenting equivalent learning and qualified faculty members, the College may use recognized guides that aid in the evaluation for credit. Such guides include those published by the American Council on Education, the American Association of Collegiate Registrars and Admissions Officers, and the National Association of Foreign Student Affairs. The Alabama Articulation Program (called STARS – Statewide Articulation Reporting System) is a computerized articulation and transfer planning system designed to inform students who attend Alabama Community Colleges about degree requirements, course equivalents, and other transfer information pertaining to specific majors at each state funded four year institution. Enterprise State Community College students planning to transfer to an Alabama public senior institution must print and retain the Articulation Guide for their major along with the transfer institution’s Area V courses. The guide and Area V course listing must be submitted to the senior institution upon transfer. Students who are interested in receiving a STARS Transfer Guide should visit the STARS website. Information is provided on page 39 in the College Catalog and Student Handbook. Information on the College’s instructional facilities and laboratories is available from the Office of the Dean of Instruction. A directory of the College’s faculty is available on the College website on pages 175 -178 in the College Catalog and Student Handbook. Enterprise State Community College is accredited by the Southern Association of Colleges and Schools Commission on Colleges to award Associate’s degrees and certificates. Contact the Commission on Colleges at 1866 Southern Lane, Decatur, Georgia 30033-4097 or call 404-679-4500 for questions about the accreditation of Enterprise State Community College. Information regarding accreditation is included in the College Catalog and Student Handbook. Information is reported to the National Center for Educational Statistics (NCES) and additional information on accreditation can be viewed on the NCES College Navigator. Enterprise State Community College respects the intellectual property rights of others seriously and expects students, faculty, and staff to do so as well. It is the responsibility of all members of the College to make a good faith determination that their use of copyrighted materials complies with the United States Copyright Law. Proper use of copyright materials also extends to electronic resources available on the Internet. Information about the College’s policy related to copyright materials of electronic resources, including peer-to-peer file sharing, can be found on pages 15 and 47-52 in the College Catalog and Student Handbook. This gives a detailed outline of policies and sanctions that may be imposed for violations. Students and others are also reminded that copyright infringement is a federal offense punishable by law. 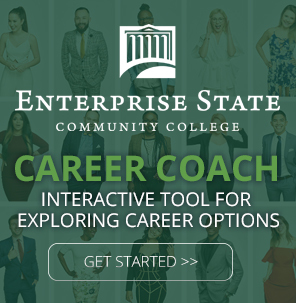 Enterprise State Community College offers activities, programs, and services that promote leadership, academic support, social opportunities and cultural experiences through clubs and organizations. Student organizations and activities give the student body an opportunity to make positive contributions to both the community and the institution. All student organizations are open to all students of the College without respect to race, creed, national origin, gender or disability. Clubs and organizations offer all students an opportunity to be involved in campus activities, to build friendships, and to serve the College and the community. A listing of clubs and organizations is included on pages 42-44 in the College Catalog and Student Handbook. Inquiries regarding student activities may be directed to Office of the Dean of Students. Enterprise State Community College makes every effort to educate students regarding the importance of exercising their right to vote. The College is required to distribute voter registration forms to students for federal elections and state elections for governor. In an effort to distribute voter registration forms to students, the College through the Student Government Association (SGA) conducts periodic voter registration drives and makes forms available on all campuses. Students interested in obtaining voter registration forms may contact the Office of the Dean of Students. Students may also visit the United States Election Assistance Commission website to register electronically. Enterprise State Community College is dedicated to assisting students who need financial aid to attend college. All students are encouraged to apply and every effort is made to communicate the availability of financial aid to students, prospective students, and parents. Information regarding student financial aid programs, services, and application procedures is included on pages 26-38 in the College Catalog and Student Handbook. Information regarding financial aid programs, services, and application procedures are included. Financial aid Information is reported to the National Center for Educational Statistics (NCES) and additional information can be found on the NCES College Navigator. Individuals may also contact the Offices of Financial Aid on the Enterprise Campus, or the Ozark Campus for all Aviation-related programs. Enterprise State Community College advises the student that a conviction for any offense, during a period of enrollment for which the student is receiving Title IV funds, under any federal or state law involving the possession or sale of illegal drugs will result in the loss of eligibility for any Title IV, HEA grant, or work-study assistance. The period of ineligibility for federal student aid funds depends on whether the conviction was for sale or possession and whether the student has previous offenses. Periods of ineligibility may range from one year from date of conviction to an indefinite period as determined by a federal or state judge. Students so convicted must also complete a qualified drug rehabilitation program. Enterprise State Community College students should go to studentloans.gov to complete entrance counseling requirements for Initial Loan Counseling for Student Borrowers. Enterprise State Community College students should go tostudentloans.gov to complete exit counseling requirements for Exit Counseling for Student Borrowers. Enterprise State Community College maintains annual information regarding graduation, transfer-out and retention rates for first-time full-time entering freshmen. While many students enter the College with varying educational goals, the College is required to disclose information for first-time full-time entering freshmen who are certificate or degree-seeking undergraduates and have completed their programs within 150% of the normal time for graduation. Graduation, transfer-out and retention rates are reported to the Department of Education through the Integrated Postsecondary Education Data System (IPEDS. Data regarding the College’s graduation, transfer-out, and retention rates can be viewed at the National Center for Education Statistics (NCES) College Navigator and Student Right-to-Know disclosures. Information regarding demographics for student athletes must be provided to potential student athletes, their parents, high school coaches, and guidance counselors when an athletically related student aid offer is made. For information, contact theAthletic Director. Information is available on the College website for Student Right-to-Know disclosures. Information is also available online for The Equity in Athletics Disclosure Act, and other information is reported to the National Center for Education Statistics (NCES) and can be viewed on the NCES College Navigator. Information regarding gainful employment disclosures for certificate and short-certificate programs can be found on the College website under Instruction, Career and Technical Programs, click on any applicable program. Disclosure links are at the bottom of each page. As part of the Equity in Athletics Disclosure Act, information on the annual participation rates and financing of men’s and women’s sports in intercollegiate athletic programs is available upon request to students and the general public. Information is reported to the National Center for Education Statistics (NCES) and can be viewed on the NCES College Navigator. For additional information or to receive a copy of this report, please contact the Athletic Director. Enterprise State Community College is committed to the maintenance of a drug-free environment for its employees and students. The College has in operation a drug abuse prevention program which is accessible to all officers, employees, and students. This program includes, but is not limited to, lectures, conferences, a Counseling Office, classroom presentations, and Student Government Association activities. This information is also located on page 14 of the College Catalog and Student Handbook. Enterprise State Community College does not have a policy regarding vaccinations; however, the College is concerned about the health and well-being of all members of the College community. In this regard, the College encourages all students and employees to remain current with vaccinations as suggested by appropriate health authorities. The Disclosure of Campus Security Policies and Campus Crime Statistics is included on pages 59-60 in the College Catalog and Student Handbook. This report is available on the OPE Campus Security Statistics website. Enterprise State Community College (ESCC) evaluates success with respect to student achievement consistent with its mission to provide “educational opportunities that enhance the quality of life and promote economic development.” Specific goals in the college’s strategic plan articulate the institutional commitment to success. A college’s ability to admit, retain, and graduate students with the potential for success is crucial to an institution. The following data includes first-time freshman enrolled in the fall semester, and of this cohort, the total number of students that returned the next fall. The graduation rate includes full-time, first-time, degree/certificate seeking students that complete within 150% of normal time. The success of transfer students in baccalaureate degree programs is an indicator of the quality of the educational experiences provided at ESCC. One performance indicator is the percentage of students who earn an associate degree or almost all of the credit for an associate degree (60 or more) at a community college, transfer to a state university, and achieve at least a 2.0 and/or a 3.0 grade point average after attempting 30 or more semester credit hours at a state university. The second performance indicator is the percentage of students who earn at least 24 but no more than 59 semester credit hours at a community college, transfer to a state university, and achieve at least a 2.0 and/or a 3.0 grade point average after attempting 30 or more semester credit hours at a state university. Comparison of results for the two indicators provides information about the impact of the amount of credit earned at a community college. Pass rates on licensure and certification examinations, whether written or performance, are valuable indicators of program quality. Student performance on these examinations is recognized by industry as measuring and documenting attainment of skill levels or competencies essential for entry-level success. Reporting includes the total number of completers taking examinations during the reporting period and the overall pass rate of completers on examinations. Evidence of Aviation Maintenance Technology (AMT) program effectiveness is measured by the percentage of program completers who pass the Federal Aviation Administration (FAA) written, oral, and practical examinations and receive FAA Airframe and Powerplant certifications. Pass rates of students on National Registry exams for emergency medical technicians is an indicator of the effectiveness of the Emergency Medical Services program. Pass rates of the EMT Basic and Paramedic exams are shown in the following table for the most recent three years. The College measures student achievement using job placement rates in career and technical education (CTE) programs as reported in the Perkins Performance Report.